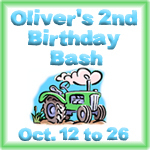 Welcome to Day 2 of Oliver's Birthday BASH! I know what you're thinking....an Arby's giveaway, how does that relate to Oliver? Well, one of Oliver's nicknames is 'Turkey Lurkey'. Why? I don't know exactly, probably because its cutesy and rhymey. What I DO know is that we all love turkey in our house because it is low in calories but yet so yummy. When Arby's approached me about their new Grand Turkey Club I knew I had to share it during this birthday bash. Lets face it, its not a party without some food! How amazing does this sandwich look? It looks gourmet doesn't it? Arby's has rebranded and they want you to know that they slice all of their own meat in house. What you get is a fresher, healthier sandwich every.single.time. Isn't that pepper bacon calling your name? 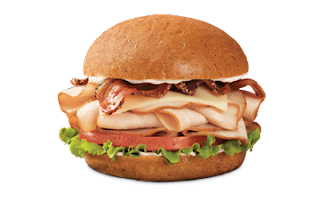 You can't go wrong with a whole wheat bun, freshly sliced turkey, swiss cheese, pepper bacon, mayo, leaf lettuce and tomato. This sandwich also boasts a whopping 29 grams of protein woot woot! I love sandwiches. I love them a lot. I love every kind of sandwich imaginable. I am the sandwich queen. When I was pregnant with Dexter, hot food turned me off. All I ate was ice cream, yogurt, cereal and SANDWICHES! Not much has changed. When lunch time comes around, I dream of sandwiches. Now, thanks to me, you won't be able to get this amazing sandwich sight out of your head! How about you enter to win a $5 Arby's Gift Card so you can try this amazing sandwich for yourself? I stay fit by drinking lots of water, exercise (When I have time) and using wraps to help keep things tight and tone! I like to walk and play with my kids! I like to play with my girls to keep fit. We like to ride our bikes to the farmer's market where we buy fresh, delicious, healthy foods. I try to go to the Gym everyday! I enjoy doing lots of walking!